This public article was written by hashi, and last updated on 29 Aug 2017, 03:07. Menu 1. Noun phrases 2. Verb phrases 3. SOV arguments 4. SVO arguments 5. Relative clauses 6. OSV situations 7. Cheatsheet Nithalosian syntax is fairly rigid in placement of its arguments and follows either SOV (most common), SVO (stative sentences only), and rarely OSV (some relative clauses). Note that the [object] section of the verb phrase, can easily be another noun phrase. 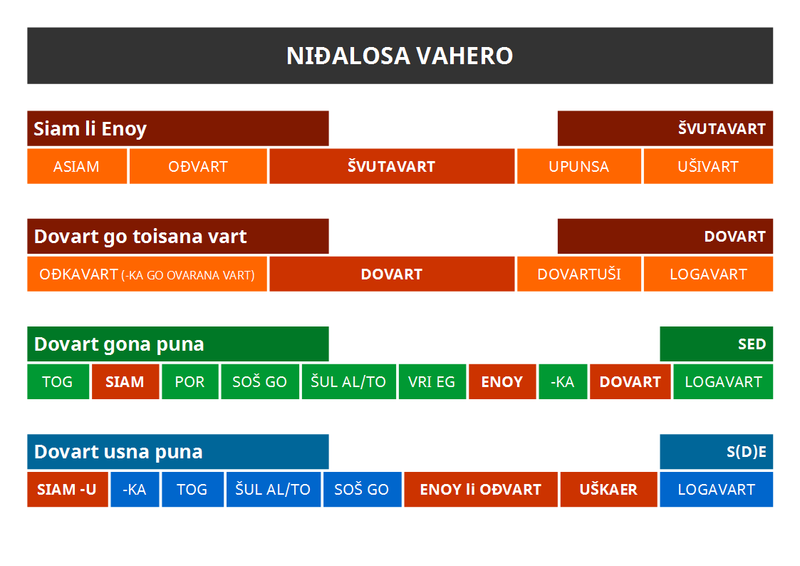 Most standard sentences in Nithalos with a verb other than the copula use the SOV word order. Certain arguments in a sentence have specific places in the sentence that they can be placed. Some have multiple. The below shows the basic pattern of these (note that NP is Noun Phrase (as above) and VP is Verb Phrase (as above)). A sentence below demonstrates a grammatically correct (although not contextually sound) sentence using all the parts as defined above. Evi veda an krađvi go samen štei pravđi eg utaru ma utariva se! But I already sang the song to dad under the tree yesterday with mum! attribute assignment) case (see other articles for more information). One of the major differences here is the placement of the adverb (after the subject, rather than directly before the verb), and the suffixes moving to the end of the sentences. The suffixes are only placed here when the object is a noun. This is because adjectives are able to take most suffixes that verbs can already. For more information, see other articles re adjective conjugation/declension. Two example sentences are below, the former showing a noun-noun sentence, and one showing a noun-adjective sentence. The weather is now not cloudy. Sou ansoka šoya'l yopo on. That is definitely not a cloud in the sky. This is described as SVO rather than SOV due to the fact that in older incarnations of Nithalos, the stative subject did not exist, and instead a type of particle-verb hybrid 'yu' existed in place of the verb. This meant that the word order was SVO. So, a relative clause in Nithalos is when you'd want to say something like 'the thing/person that/who/which does something'. In English, there is the basic pattern 'SUBJECT that VERB'. Nithalosian syntax is a little different: 'VERB-na SUBJECT. The entire phrase that modifies the noun must come before it, with the verb taking the relative suffix -na. The two below sentences shows the basic difference between an indicative sentence, and a relative sentence. The man eats the carrot. The man who eats the carrot. Evu seta akašeu taprina poske po ami. I think that he is now the man who eats carrots. In situations where the parent clause is spliced by a rather long relative clause (and the relative clause is the object of a sentence), the syntax of the parent clause changes to OSV to make it easier to decipher. There are no concrete rules about when this should be done, but it is something you learn to use discretion with. One pretty black and white situation is where the relative sentence has a subject; this is to avoid having the two subjects adjacent one another. The two example sentences below are both grammatically correct, however the latter sentence (with the inverted OSV order) is considered to be much more natural. Mo an veda mayađ ota'l rorivana tudiu vromi? Do you like the cake I baked yesterday in my own kitchen? An veda mayađ ota'l rorivana tudiu mo vromi? Below is a cheatsheet for Nithalosian syntax (although written in Nithalos).